At the end of the walk we assembled quietly on the bank of the river as the tide turned and the river began to flow again towards the sea. We collected out thoughts and reflected on the 8 days, remembering each one. Dried blue flowers from the beginning, seeds at the finish. Items returned with love and memories for the next time. A sprig of blue flowers from the sea wall at Bradwell, picked on the day our river pilgrimage began, their blue contrasting with the flag we walked between them. A spare coat button once in a small torn plastic bag found on the path, for my mum who further humiliated me when I lost a primary school playground fight. 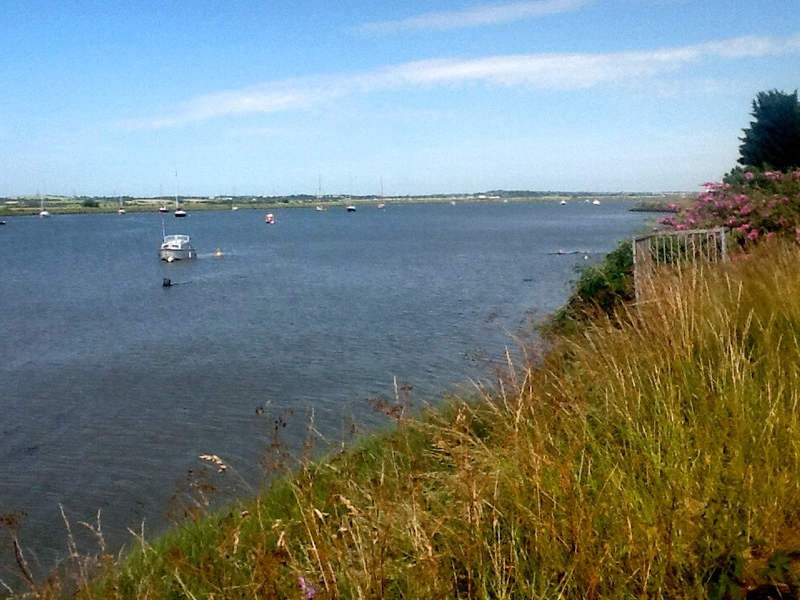 Cast into an ebbing tide on the River Crouch at Hullbridge on Saturday 4 July. The end of the walk. Tags: Essex, relics, walkingart | Permalink.